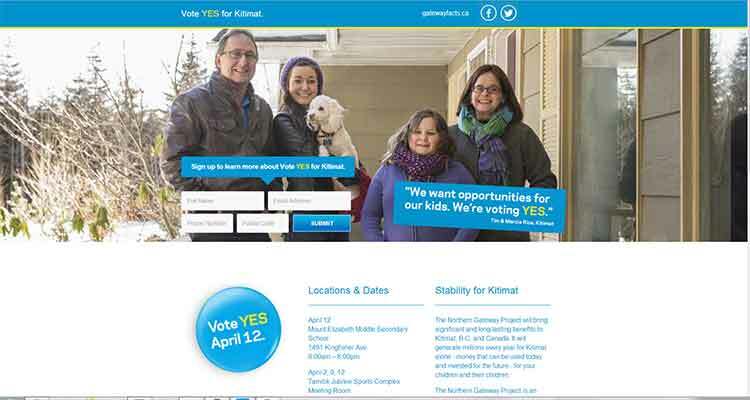 Landing page for the Enbridge Northern Gateway “yes for Kitimat” web campaign. With about three and half weeks to go, the campaigning on the for and against sides for the April 12 Kitimat plebiscite on the Joint Review Panel report on the Northern Gateway has been relatively low key up until now. That changes with the news that Northern Gateway will hold two campaign Open Houses. Sources have told Northwest Coast Energy News that the first Open House, hosted by Northern Gateway President John Carruthers, will take place at the Rod and Gun on Tuesday, April 1. The second Open House will be hosted by Janet Holder, Enbridge’s Executive Vice President of Western Access, on Tuesday, April 8, also at the Rod and Gun. Until now, Enbridge Northern Gateway has been using its deep pockets with a newspaper ad campaign emphasizing Kitimat residents and the promise of jobs, as well as a new website Yes To/For Kitimat. 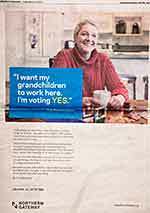 Northern Gateway has also started a telephone campaign, asking residents if they plan to vote “yes” in the plebiscite. The main opposition, Douglas Channel Watch, is concentrating on what political analysts call the “ground game,” by knocking on doors. Douglas Channel Watch, although they claim to be amateurs facing a giant corporation, are following a classic political strategy. DCW is certainly confident of the “no” vote and their campaign so far, is aimed at fence sitters and those who are in favour of the pipeline but are uncertain about the 209 conditions. 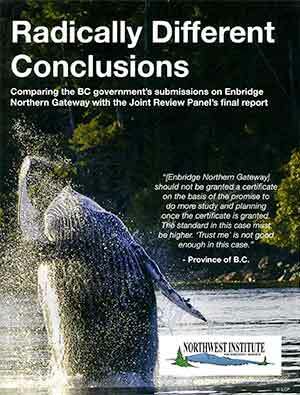 The third player, so far, is Smithers based Northwest Institute for Bioregional Research, which distributed a glossy brochure, comparing the BC provincial government’s final arguments on the project with the Joint Review Panel’s conclusions. The opposition campaign is concentrating on the perceived lack of balance in the Joint Review Panel, while, again, so far, Enbridge Northern Gateway is avoiding the JRP, perhaps because the company itself is not all that certain about what all 209 conditions actually mean. In the unlikely event of a large oil spill, we found that there would be significant adverse effects on lands, waters, or resources used by residents, communities, and Aboriginal groups. We found that the adverse effects would not be permanent and widespread. “What we found out that there are five key reasons why even supporters of Northern Gateway were going to vote no on the plebiscite and people who were sitting on the fence were considering voting no on the plebiscite. “So by voting no we will be sending a message to Ottawa telling them we don’t want temporary foreign workers taking jobs from Canadians. We don’t want thousands of jobs being exported overseas. We don’t want up to 364 dilbit super tankers a year, and the 364 supertankers is based on the actual amount of product that will be put through the pipeline since they’re only applying for 525,000 barrels a day but its actually designed for 850,000 barrels a day, so that’s how we come up with the figure of one super tanker a day, coming to Kitimat and one leaving. 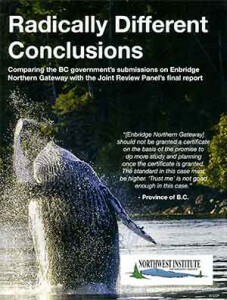 Enbridge’s only public appearance early in the campaign was when Donny van Dyke, Northern Gateway’s Manager of Coastal Aboriginal and Community Relations, outlined to council on March 10, the contributions that Northern Gateway has given to the community and to local training programs. Van Dyk said the Northern Gateway supported training programs that will also be used by other new industrial and commercial projects. He said training with the company’s partners create life skills, noting that one focus of the training is to help people who may have barriers to education, life skills and gainful employment. Van Dyke says the company plans Northern Gateway Youth Achievement Awards for outstanding students going beyond academics. As part of the awards, 50 winners received iPads. Van Dyk said that Northern Gateway has contributed $20,000 to community groups within Kitimat, including $7,500 this year . They contributions include: $100,000 for marine skills training, $145,000 for Environmental Field Assessment training, $110,000 went to the Pipe Trades Foundation for training and financial support and $5000 for trades training for local high school students. The company has contributed $225,000 to Project Shop Class, a construction trades program, with $100,000 earmarked for the high schools in Kitimat. 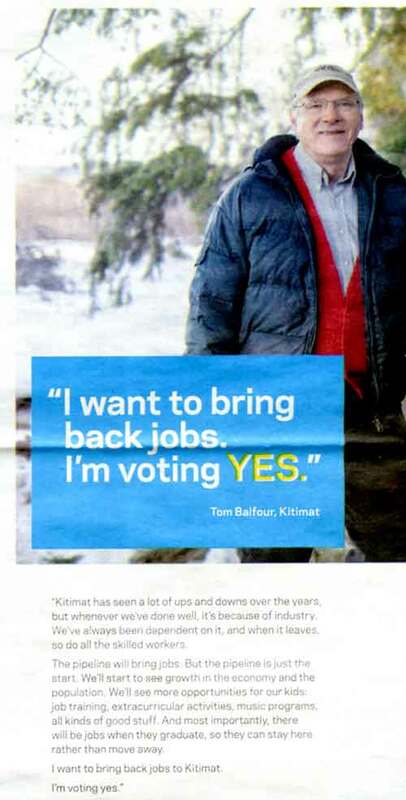 Northern Gateway’s ads both in local newspapers and on a new website yesto kitimat.ca are emphasizing long term jobs. The Northern Gateway ads have created vigorous debates on social media, with many of the comments opposed to the project, including resentment at the money Enbridge is spending on the ads and the idea that Northern Gateway has “infiltrated” a community event. At the council meeting, Murray Minchin of Douglas Channel Watch pointed out that the according to the BC elections act third party advertising is capped at $3167.93 per electoral district, which given the fact that Black Press charges $8,250 for a full page colour ad in its newspapers, that if the plebiscite was a provincial election, Northern Gateway would have already far exceeded those limits. In a free society, Enbridge Northern Gateway, as the proponent of the project, has the right to campaign on behalf of the project. It is not the same as a third party intervention in a general election. 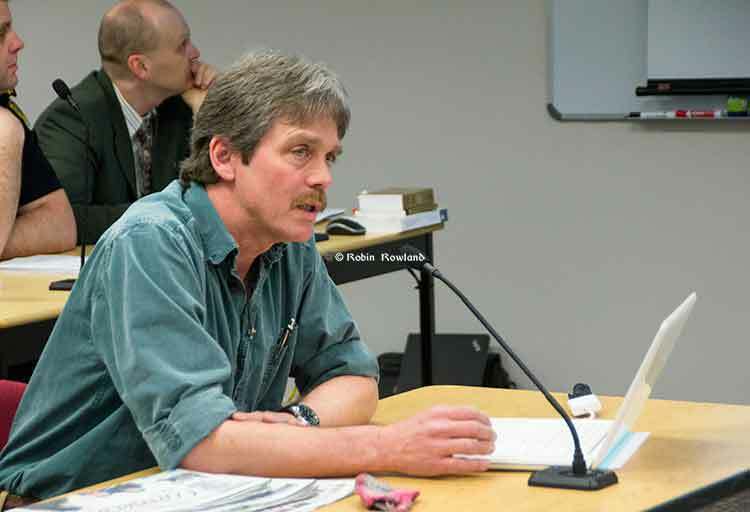 The overall problem is the short-sighted, half-hearted approach that the District of Kitimat Council has taken with the plebiscite, which now goes beyond the confusing plebiscite question. The rules as released by District only mention signage. There was apparently no anticipation that campaign spending could be an issue, even though one side was a well-financed large corporation and therefore no research if campaign spending limits are permitted in a municipal non-binding plebiscite. The confusing plebiscite question and now the issue of campaign spending can only raise doubts about whether or not the community accepts the results of the vote, especially if the outcome is close. Apart from the fact that Northern Gateway confidently believes it can foretell the future, that the pipeline will bring sustained growth in the Kitimat economy, here is what that Joint Review Panel said in its official report on the number of permanent jobs. 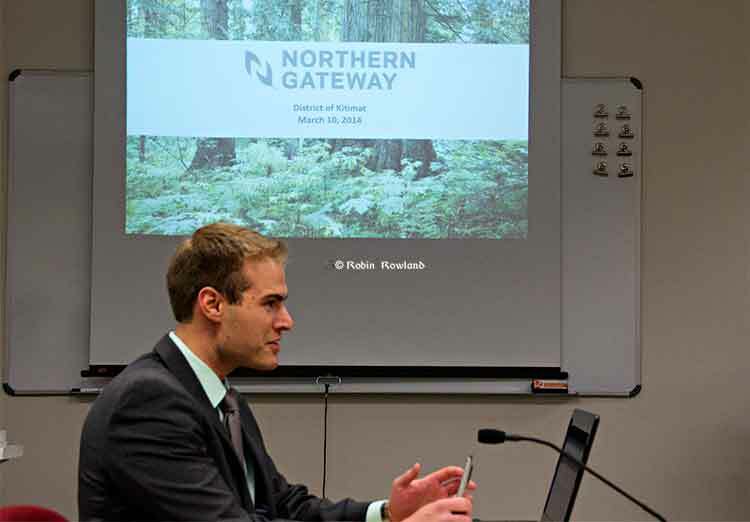 Northern Gateway said that the number of permanent jobs during operations would total 268. This includes permanent workforce requirements in Edmonton, Fox Creek, Whitecourt, Grande Prairie, Tumbler Ridge, Prince George, Burns Lake, and Kitimat. It said that this also includes people expected to be employed in Kitimat to supply services associated with operations of the Kitimat Terminal, including tug operators, pilots, emergency response staff, and various other service providers. This means that Northern Gateway will provide less than 300 permanent jobs spread across the entire pipeline route, and many of them will probably be at Enbridge headquarters in Edmonton. The number of permanent jobs at Kitimat have been estimated from as low as 25 to as high as 60. That is hardly a big boost to the Kitimat economy. Douglas Channel Watch has kept its message clear and simple. Both in its press release and in Murray Minchin’s statement to council, he is calling on Kitimat to “send a message to Ottawa.” Given the record of the Harper government on issues such as the BC wide objections to the closing of the Kitsilano Coast Guard base, it is likely that even if there is an overwhelming “no” vote in Kitimat, Harper, his cabinet and officials will ignore the plebiscite result. It would take more pressure than from the residents of Kitimat for Harper to pay attention. Of course, the Northern Gateway may yet garner worldwide attention like the Keystone XL has. But the big problem, as the Ottawa pundits have pointed out, if you get Harper’s attention, the result is often vindictive rather than seeing someone else’s point of view. Up to now, except for an occasional obligatory visit to the Haisla Nation, for the Conservatives, Kitimat is out of sight and out of mind. The other small mistake by Douglas Channel Watch came a couple of weeks ago when Murray Minchin, when calling for a public forum prior to the vote, said that Kitimat didn’t need a speaker like former Dawson Creek mayor Mike Bernier (now a Liberal MLA) who Minchin said took the focus off the issue of the pipeline. However, it was Bernier, who, two years ago, warned Kitimat about the problems of work camps and a potential housing crisis. It appears that Bernier’s warning fell on deaf ears, given the current housing crisis in Kitimat. Earlier this story said “Douglas Channel Watch is also hosting an event with author Arno Kopecky at Riverlodge on Saturday March 29th at 7 pm for a talk on his book Oil Man and the Sea, Navigating the Northern Gateway.” Douglas Channel Watch says it is not hosting the event, but members of the group were spreading the word about Kopecky’s appearance.